Calgary Rants: Alderman Joe Connelly Has No Chance At Becoming Calgary's Mayor in 2010! Alderman Joe Connelly Has No Chance At Becoming Calgary's Mayor in 2010! Its good to have goals. Even better, some say you must dream big if you ever want to be successful in life! That said, I think that Alderman Joe Connelley's dream of becoming mayor is way bigger than he will ever be able to achieve. In light of Mayor Dave Bronconnier's announcement that he will not be seeking re-election, first term Alderman Connelly has decided that he is mulling over a potential run at the mayors chair. The only problem? He has no support and no money. "If I want to go be a bus driver, then I'm going to go be a bus driver. If there's any bus driver out there that's upset, well, then run for politics next time, run for politics in two years and hopefully you'll get there and hopefully you'll be making more money than a bus driver." "Come and run against me, that's the way it works." He also added "You get what you pay for." "The deal is if you want better politicians you've got to pay them better money. Bottom line, that's where it sits." This tirade was in response to the Aldermanic pay raises and what effect it would have on pending salary negotiations with other City of Calgary Employees. Honest? Perhaps it is, but it was not very well thought out in my opinion. This alone will cost him a ton of support and dents his credibility as a 'mayor' calibre candidate. 1) Joe is not running for mayor in 2010. One day? Maybe....but not this term. He lacks all of the most important requirements to win.... Money, Name Recognition and a Team. 2) This website is just part of Joe's early campaign strategy for re-election in Ward 6. 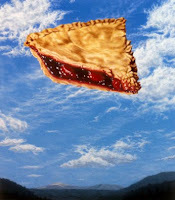 Pie in the Sky indeed. Alright now Joe....come clean! Tell the good people of Calgary that you are NOT running for mayor. Just let them know that they heard it here first! Perhaps next time, you could attach some facts to your blog. "he has no money" - how do you know? "he has no support" - as evidenced by what? "Honest? Perhaps it is, but it was not very well thought out in my opinion." - Are you talking about Connelly or your blog? Hi Anonymous, thank you for taking the time to come out of the darkness to share your comments! Since you are so well connected with this losing campaign I would welcome your input on where his money and support would be coming from then? One can deduce that a politician with 35 Facebook fans is never going to light the campaign on fire. Not with donations and not with votes. I always welcome different views on this blog, so thanks for commenting! Ha ha. Said the guy who won't put his last name on his own blog. You're free to deduce whatever you want, but if the premises of your deductions are inaccurate, then so to are the deductions. And no, I'm not connected to Connelly's campaign...which seems to make me as much of a source on it as anyone else in the blogosphere. My friend, I am active in the community and on provincial and federal constituancy association boards, so I am NOT hiding my last name from anyone. ( Byciuk) In fact, most bloggers do not even show their picture and/or name, so that comment is just silly. Seems to be a rash of Anon's pointing fingers at bloggers who freely have their identity on display. Hi Jer! LMAO! You know I respect those who have an opinion...especially those that show it to the world. Great work lately btw. I really wanted more anonymous talk on here. He/she can always come over to my blog to bash me. I have to support Joe Connelly in regards to his comment, "if you want better politicians you've got to pay them better money.” I would like to see top city officials paid more. Those that posses the attributes required to be a great political leader are hard to find and have often already achieved success in venues outside of politics. In order for these candidates to pursue a career in politics sufficient momentary compensation should be provided. Hypothetical question: If I needed bypass surgery and was given a choice of surgeons based on salary which one of the following would I likely choose? Surgeon A earns $50,000 a year, surgeon B earns $65,000 a year, and Surgeon C earns $300,000 a year. I know I would choose surgeon C. Chances are there is a good reason he is highly paid, has the highest level of training possible, and is able to focus 100% of his energy on the task at hand. Just thought I would play devil’s advocate. I'm Boycotting Bed Bath And Beyond!